The Town Hall has announced that its use of controversial glyphosate weedkillers on Hackney’s streets has halved since 2017 – but campaigners have repeated their demand for an outright ban. Amid concerns about the safety of the chemical, found in the herbicide Roundup produced by agriculture giant Monsanto, the council has taken steps since last May to reduce the amount it sprays on the borough’s streets. This includes cutting the number of roads sprayed by the chemical by 20 per cent and spot-spraying rather than sweeping over large areas. Last week the council revealed that these changes had resulted in a 50 per cent reduction in on-street spraying against 2017 levels, amounting to a reduction of approximately 600 litres of glyphosate a year in the borough. 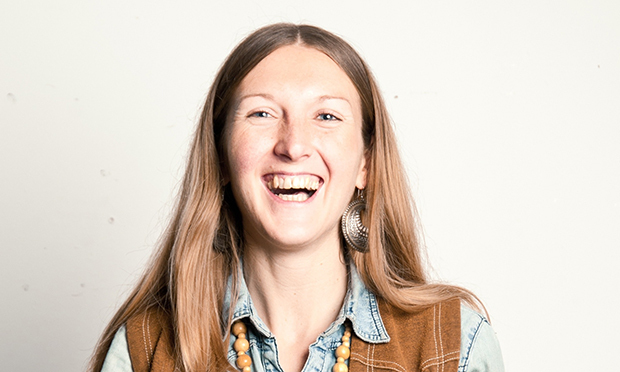 Anti-pesticide campaigner and Made in Hackney founder Sarah Bentley. Sarah Bentley, member of Hackney Pesticide Free campaign and founder of Made in Hackney community cookery school, said: “This is a great start and it is most encouraging that the council are taking note of the growing evidence that glyphosate is poisonous and dangerous to health. Concerns around glyphosate have steadily increased since a World Health Organisation (WHO) study in 2015 found it is “probably carcinogenic to humans”. On 27 March, a US federal jury in California ruled that Monsanto was liable for the rare blood cancer suffered by Edwin Hardeman, who testified that he had used Roundup for three decades before his cancer diagnosis. It was the second high-profile ruling against Monsanto’s owner, pharmaceutical company Bayer, after former-groundskeeper Dewayne Johnson was awarded $289m in November last year after developing terminal cancer. These renewed health fears have prompted councils throughout the UK to re-examine their use of the chemical in public spaces. 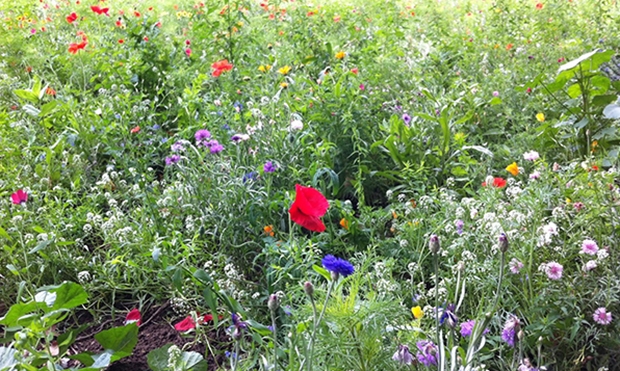 Already in 2019, local authorities in Bristol, Derry and Trafford have committed to move towards becoming pesticide-free. Councils in London are also pledging to ditch Roundup, with Croydon committing to ending its use of glyphosate in all of its public parks and green spaces in December 2018, while Richmond is to begin trials of non-chemical weed removal next week. Bentley would like to see Hackney follow in their footsteps. She said: “When we met with the council at the start of the campaign, they expressed concerns about tidiness, trip hazards, damage to pavements and cost of alternative methods. “They also said they’d trialled an alternative product that didn’t work – although when we spoke to the manufacturers, they said they had used it incorrectly. 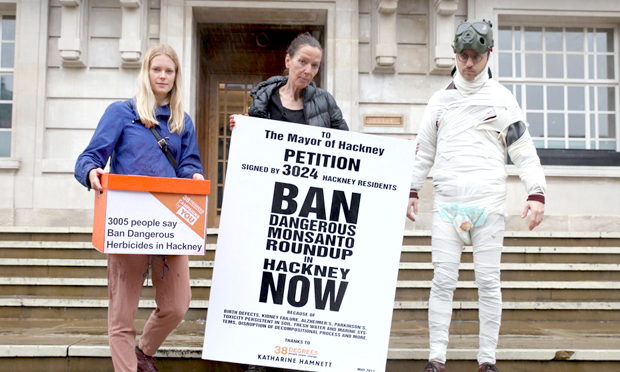 Ban glyphosate: Katharine Hamnett (centre) on the steps of Hackney Town Hall in 2013. Environmental campaigner and fashion designer Katharine Hamnett CBE, who has been protesting against the use of pesticides in Hackney since 2014, said the council’s announcement was “not good enough” and called for a total ban of the chemical. Hamnett complained that she was “stonewalled by the council” after launching a petition to ban the spraying of glyphosate in Hackney’s green spaces and said she was “really shocked” by its lack of action on the issue. John Wheatley, head of environmental operations at Hackney Council, said it is continuing to keep the use of glyphosate under review, but any decision to ban the chemical would have to be accompanied by an alternative approach to weed control. He said: “I am highly aware of the strong desire of residents that their streets should be kept clean and clear of litter. He added that an independent review by Public Health England (PHE) into glyphosate levels in London Fields in 2014 found the concentrations to be safe and not a risk to public health. Cllr Jon Burke, cabinet member for energy, sustainability and community services, said the variant of glyphosate used in Hackney is declared safe and licensed for use by Defra, the Health and Safety Executive, and the European Union.